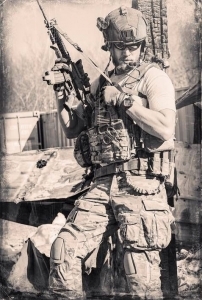 Whether you are gearing up for a deployment and need a battle tested timepiece or you are simply looking for a nice military inspired watch, here are a few things to consider. What exactly do you need the watch to do? While finding the right watch some features and aspects will remain important no matter the intended purpose for the watch, such as accuracy and dependability. However, some features may one individual more than others depending on how they intend to use the timepiece. For example, a pilot will have different needs than an infantryman diver, who in turn will have different needs than a diver. Our list provides an overall top 5, and rates them in overall usefulness and durability. Any watch you consider for tactical use needs to be able to take a lickin’ and keep on tickin’. Main features to look for are shock, water, and scratch resistance. The watch should also be able to handle hot and cold, snow, sleet, hail, and any other severe weather conditions you may find yourself in. 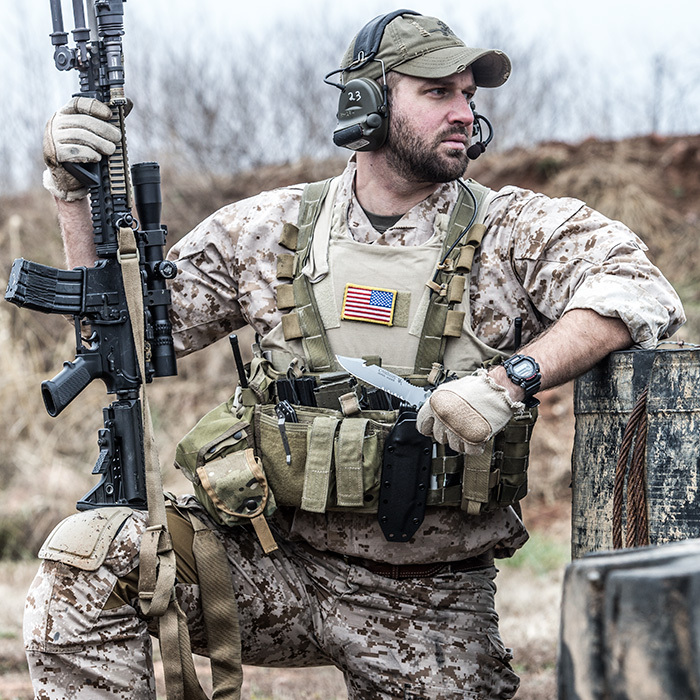 When looking for a great durable watch, it’s best to with tried and true brands that have been used on the battlefield with success. Do not to gamble with the latest new shiny tac-company or unknown brand. Warranties are also a good indication that a brand is willing to stand behind its product. Additionally, for accuracy and durability, most military personnel opt for a quartz movement watch. Quartz is capable of lasting years on a single battery while keeping perfect time. Considering digital versus analog seems like a simple aesthetic choice. People generally assume that digital is the better choice for visibility. However, analog watches allow better readability. This is achieved with a simple twist of the wrist and no need to press an illumination button and use both hands. Most good, modern, tactical options combine the two elements to offer the best of both worlds. This delivers the readability of analog with the accuracy and additional features digital. 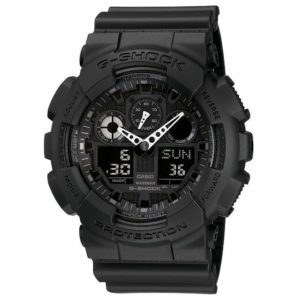 You will be hard pressed to find a better tactical watch for the money than the G-Shock line of watches. I personally own a GA-100-1A1 and love it. The first thing that stands out is the ultra readable, high-contrast hands on the otherwise blacked-out watch. This visibility comes in handy in low light conditions. One negative of this watch is that the hands on this model are not luminous and is not an option on this coloration. The reason for this is that if you are wanting to remain invisible, glowing watch hands could be an issue. We have found the hands are bright enough to see in most low light conditions, and if you do need more light there is an in watch light that can be activated, but requires your second hand to operate. Additionally, you can set the watch to illuminate when you shake the watch which has an afterglow effect. The size of the watch also helps generally make it more legible. This beefy watch comes in at 55mm, so you definitely know it’s on your wrist, even if it only weighs 70 grams, or about 2.5 ounces. The blacked-out color scheme is unique and attractive, but it can make the digital portion of the watch difficult to read in daylight. Also, at certain times the analog hands of the watch can partially obstruct the digital displays, making them harder to read. The battery life is somewhat standard with Casio recommending battery changes every 2 years. However, if you don’t aggressively use the alarm or lighting functionality, most users report longer battery life. The functionality is a great blend of practicality. The watch has 29 time zones to function through and features 48 cities that is easy to cycle through. Setting a home city is also a breeze, so that you can revert back to your favorite time zone, even if you’re constantly traveling. The timing display can be toggled between 12 and 24 hour formats, and the watch has a fully automatic calendar programed until the end of 2099, so there is a decent chance this watch will last longer than you will. The stopwatch is accurate to 1/1000th of a second and the countdown timer is useful. The G-Shock also has 4 alarms to make sure you’re never late. The G-Shock DW9052-1V is a proven watch available on a budget. This watch has been around the globe and delivered many times over. Additionally, it more often than not, can be found for less than $50. At that price, the value offered by the DW9052-1V is unmatched. One of the watches strong points is it’s simplicity. It gives you all the information you would expect of a modern military watch in a simple format. It clearly displays the day, date, and time, which are the primary functions for the average user. It is rugged, and obviously so beig shockproof, and water resistant down to 200 meters. To give some idea of what this translates to in application, the DW9052-1V is commonly purchased by entire battalions before deployments because of its simplicity, durability and the fact that the watch has a 2 year battery, which will easily last a deployment unless you use the illumination constantly, and even then, there is a good chance the battery will last the deployment. The build quality is exactly what you would expect from a G-Shock, which are known around the globe for quality. This watch one of the best shockproof, affordable digital watches on the market. 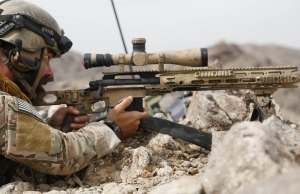 A sharpshooters dream, this watch is amazing. 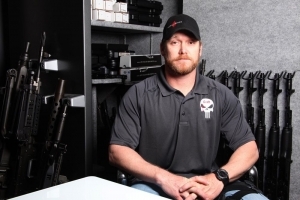 5.11 tactical, which is well known in the tactical industry, nailed with this one. Readability is not an issue with this watch with it’s oversized dial. It is much more legible than some other tactical watches, including most of the G-Shock line. The illumination of the watch is bright and clear. The large 50mm diameter makes the watch easily visible under most conditions. The high-density polycarbonate frame feels tough and features an omni-directional bezel. 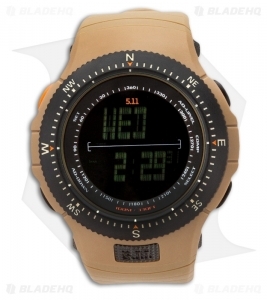 It has an alarm, timer, and digital compass, which is always useful to those spending serious time in the outdoors or for military and tactical application. The compass is very sensitive and accurate making it a reliable navigational tool. However, the main draw of this watch is the SureShot ballistic calculator from Horus Vision which calculates windage to 1,000 yards and beyond. If you’re interested in distance shooting or firearm competitions, this is an amazing feature. The watch is water resistant down to 100 meters, so will handle most use cases, but is not an all out dive watch. This watch has some nice accompanying features. The strap is polyurethane and includes a strap extender if you have larger arms or if you wish to wear the watch outside of your clothes or gloves. 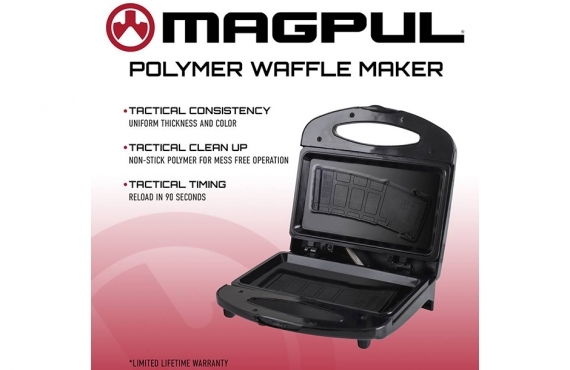 It comes in a ballistic nylon case and includes an allen wrench to make adjustments. This watch is available in black and tan colorations and comes backed by a two year warranty. 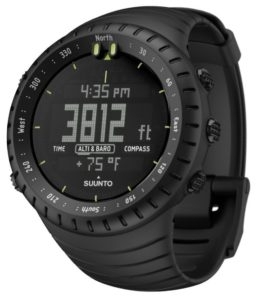 The Suunto Core a watch is more of a wrist worn computer than a watch due to the Core’s impressive functionality. The Core features an altimeter, thermometer, barometer, compass, and sunrise/sunset locations for over 400 locations in addition to telling time. While these features make it sound as though the Core would have a confusing interface, it is actually very simple to navigate. If you’re are military or an outdoor enthusiast, it is plain to se how useful these features would be. The build quality and materials of the Suunto are top notch. The watch is incredibly easy to read with a large display. Despite being a negative display, the size of the display more than makes up for this. If the negative display of the all black model is an issue, the Core comes in a variety of colors and display options, so finding something to your taste should be simple. The buttons are well designed and easy to engage. If you’re a minimalist this is the watch for you. 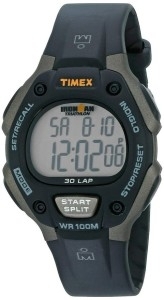 It’s the Timex T5E901 Ironman Watch and this thing can take a lickin’ and keep on tickin’ like a boss. It tells you the day, date, and time on a very clear and efficient display. As you would expect, it has a stopwatch and indigo features that work well and are easy to operate. There are 3 alarms, and the battery life is good as well. There are two features that separate this watch from some of the other options on this list; size and price. The 38mm resin case easily fits under any sleeve size and doesn’t add too much weight to your arm. Unlike other bulkier watches, you will rarely bang this watch on things and you won’t be carrying around extra weight. Furthermore, this thing is a bargain. It is insanely cheap for how durable it is. The watch is water resistant to 330 ft, or 100 meters. The watch is simple but it is incredibly utilitarian and durable. Aptly named the Ironman, we haven’t seen an environment where this watch doesn’t hold up. 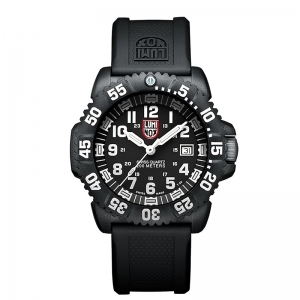 The Luminox 3050 series is not a budget watch in that it lists for $395 and is over the $200 mark even on Amazon. With that said the 3050 is a terrific watch and deserves to be mentioned in this article. This watch is a tough as nails analog watch that is housed in a 44 millimeter carbon reinforced PC case. The movement is a quartz movement, and can be accessed through the screw on case back. The movement has a date feature in addition to the time which is displayed in a window at the three o’clock position. The dial has 24 hour markings and is illuminated with Luminox Lighting Technology (LLT) that the company claims will last 25 years with no need to be charged. One feature that we like about the lighting is the contrast between second and the minute and hour hands, so you can quickly identify the hands in darkness. Further, the 12 o’clock position is illuminated green in contrast to the other hour markers, which are illuminated blue. The bezel features a 1 way rotating bezel, as you would expect from a dive watch. The watch is water resistant down to 200 meters or 660 feet. The watch weighs 56 grams, or about 2 ounces, and has a case height of 13.8 millimeters. 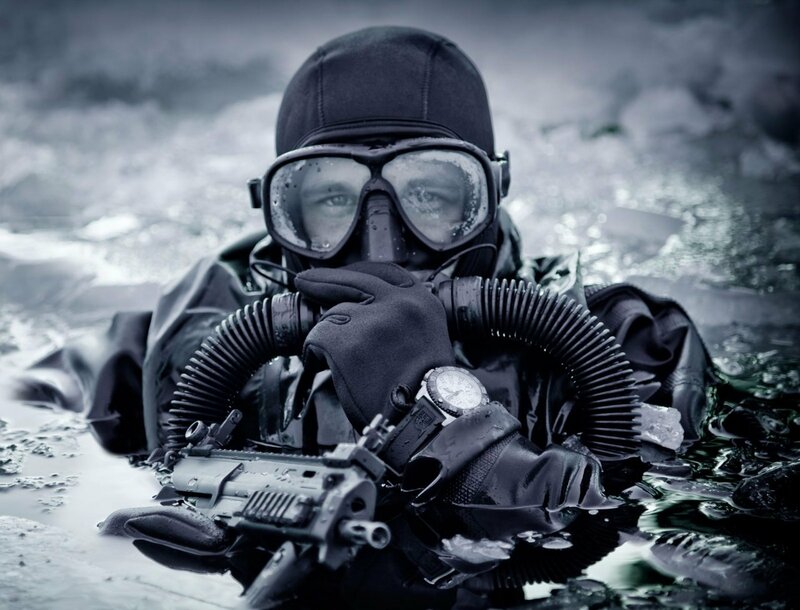 The Luminox is employed globally by more special operations forces than the U.S. Navy SEALs, and they list other organizations like the FBI, US Air Force, and a host of SWAT teams. This watch comes in many different colorations, and could be just what you are looking for if you have the budget and want a simple but proven analog option. Previous article Why is the Flag patch “backwards” on Military uniforms?